If you would like to support Carnarvon Traders and contribute towards the running costs, a donation would be very welcome. Any amount, however small, will be gratefully accepted. Thomas & Edwards, of the Castle Works, were manufacturers of 'pop', which they marketed in an eye-catching design of bottle. 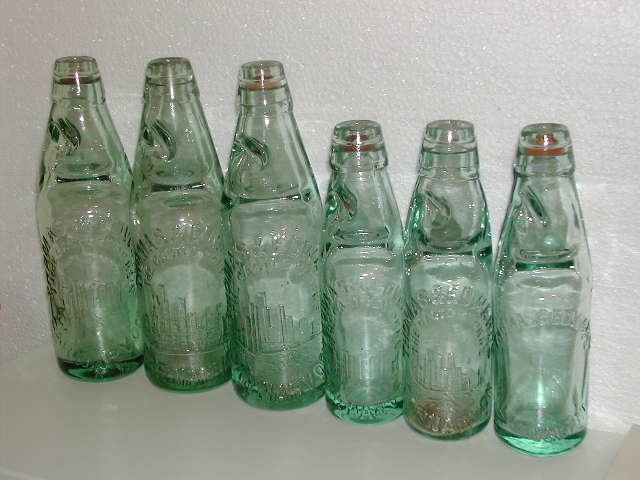 These bottles, known as "Codd bottles', had a distinctive method of closure - a marble. What is special about these bottles is that they feature a wonderful pictorial trade mark showing Carnarvon Castle. I have a number of these bottles available to purchase. Each date from the 1890s through to the World War I period. There are a number of different designs to the castle, the bottles will be chosen at random and a particular style cannot be guaranteed. There are two sizes: large (approx 9" tall), and small (approx. 7.5" tall). Price is £15 each, post paid to any address in the UK. If you are located outside the UK please contact me for a quote. We specialise in Caernarfonshire, Anglesey, Denbighshire, Flintshire and Merionethshire research, but can also carry out work for the whole of England & Wales. See our website for further details of our services. 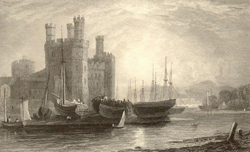 30 years' experience of family & local history research in North Wales. For a fast, friendly and professional research service, at reasonable cost, click on the link below. Segontium Searchers have teamed up with Celticos to offer bespoke Family Tree tours. Let Segontium Searchers carry out the research and identify the places connected to your forefathers. Celticos will then provide a tour specially tailored to the history of your family. Celticos offers guided themed & nature walks, craft & hobby courses enhancing the Outdoor Tourism spectrum in Conwy, Snowdonia & Anglesey, North Wales. New book out now. Thomas Williams of Penmachno enlisted in the army in 1915 and served in the Great War right to the bitter end. This is his story, told by his nephew, family historian Hywel Roberts. The Royal Welch Fusiliers Museum in Caernarfon have started the mammoth task of looking for photos of individual soldiers from the RWF who were killed in the Great War. They will be putting each man’s name on display on a screen on the centenary of his death and would dearly love to be able to add a photograph of each man to go with his name. It is a huge undertaking as there were over 10,400 men from the RWF that were killed. But even if they only get a fraction of the photographs they believe it is worth doing. Many of the RWF were from all over so they are asking please could you help?